This vintage Nemesis is a rare knife that dates back to February 2000. It is in near mint condition and shows no sign of being used or handled. The handle is marked 2/2000, number 1297. The charging handle has "W. BREND" written on the back side. 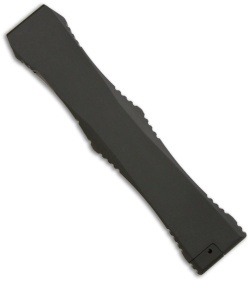 This knife includes the original box, paperwork and kydex sheath. Pictures above are of the actual knife for sale. 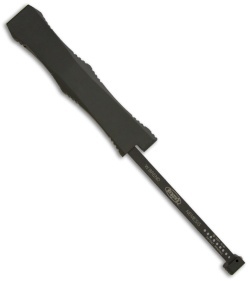 This Nemesis features a Walter Brend ground, hand rubbed satin finished double-edged dagger blade with plain edges. The handle is black anodized aluminum with the production date (2/2000) and serial number 1297. The push button and safety are bead blast finished. 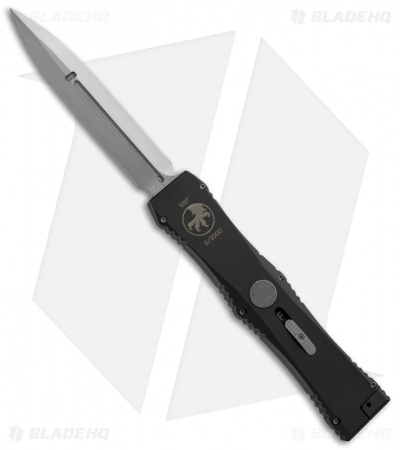 The Microtech Nemesis is a single-action out-the-front knife. The firing button is on the face of the handle with the safety below it. The Nemesis has a "liner-lock" type mechanism that secures the knife open.